The Minnesota Department of Agriculture reported this past week that the Emerald Ash Borer has been detected in Minnesota. 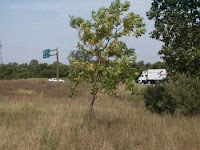 This is awful news for both trees and the economy in the state. 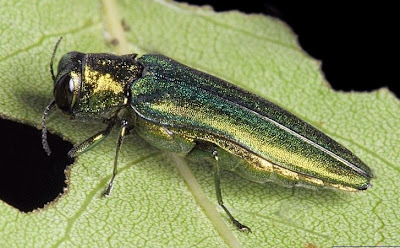 There are an estimated 900 million ash trees in Minnesota and these beetles could kill all of them. I checked on the ash tree in my front yard this weekend as I live less than a mile from where the Emerald Ash Borers were found. Best case scenario, they can move 4 miles per year so it is very likely there are already ash borers in my neighborhood. Uncontrolled, they can move about 18 miles per year. As trees come under attack the tree is weakened and leaves turn yellow long before fall. While there are a number of reasons trees can turn yellow early this is still a good warning sign. Any tree turning yellow early should be examined as there could be other problems that need to be addressed. 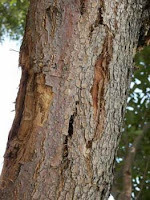 With the Emerald Ash Borer the tree may also be completely devoid of leaves. As beetle larva feed under the bark it can crack and loosen. Woodpeckers may also be attracted to the trees at this point. The tree has a diseased look. An old dying tree can look like this as well. 3) "D" shaped exit holes. 4) "S" shaped larval galleries. This photo shows both a d shaped exit hole and an "S" shaped larval gallery. 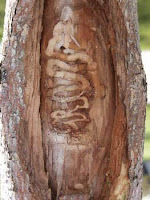 As the larval stage of the Emerald Ash Borer grows and feeds under the bark it snakes back and forth leaving this pattern. This photo is particularly interesting because you can actually see that the gallery is narrower at the bottom than the top. As the larva feeds and grows is bores a wider and wider path. 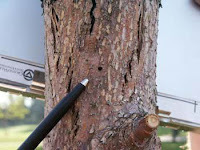 There is no way to stop the Emerald Ash Borer. Now that it has been found in the state all we can do is slow it down and kiss our ashes goodbye.